…now attack it with scissors! OK, so unlike the last one I didn’t *actually* say that, but I’m a sucker for a catchy title. Last time dear reader, you joined me as my year 12 students were hurling balls of paper across the room at each other all in the name of revision. I thought I’d finish the story of what we did next. One of the things many students struggle with a A Level is the structuring of their essay. They know what to put in, but give little thought to the best order for the points to be made, or how to link them together. So, we took the sheets of paper with all the ideas for our answers and cut each person’s contribution out. 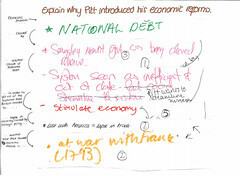 Then, issued with a fresh sheet of paper and a glue stick, students worked in pairs to decide what points were going to be jettisoned [1. you can’t include everything, you don’t have time – therefore selecting the most appropriate things to include is a vital skill], and in what order those points that survived should be put. I wandered around getting them to justify their choices and clearing up any misunderstanding. Finally, students had to draw lines between each section and say how they’d link each paragraph together. Did one cause the other? Where the caused by the same thing? Was one the next event chronologically? Again, by making these things practical and hands on, the feedback was that everyone benefitted – those that were already doing it benefit from explaining their choices to others, those for whom the lightbulb hasn’t yet gone on have it broken down step by step and hopefully start to get what to do to access the higher mark bands. ...and now throw it across the classroom!